Filmmaker Sanjeewa Pushpakumara is a bright star in the cinematic firmament of Sri Lanka. His second feature film ‘Davena Vihagun’ (Burning Birds) is currently being screened in Sri Lanka. The film completed in 2016 has been shown at several international film festivals over the past two years. Just like Pushpakumara’s first film ‘Igillenna Maaluwo’ (Flying Fish), his second feature film too has earned much kudos internationally. The jewel in the crown was the Grand Prix award for Best Film at the 15th International Film Festival and Forum on Human rights (FIFDH) in Geneva. Among the films competing alongside ‘Burning Birds’ for the prestigious award was the Oscar-winning USA film ‘Moonlight’. Other noteworthy films in the competition were Aki Kaurismaki’s ‘The Other Side Of The Hope,’ Oliver Laxe’s ‘Mimosas’, Keywan Karimi’s ‘Drum,’ Eliane Caffé’s ‘Era o Hotel Cambridge,’ Daouda Coulibaly’s ‘ Wùlu,’ Michele Placido’s ‘Seven Minutes’ and Bertrand Bonello’s ‘Nocturama’. Outlining the reason for bestowing upon Pushpakumara the Grand Prix award for ‘Burning Birds,’ the citation stated it was for “combining the art of cinema with talent and commitment to human rights, the filmmaker unveils the situation in Sri Lanka and courageously denounces the harsh reality of women living in war contexts”. The story and script for ‘Davena Vihagun’ was written by the director Sanjeewa Pushpakumara himself. The story is set in Sri Lanka’s eastern District of Trincomalee. The year 1989 is the period of the movie. 1989 was a watershed year for Sri Lanka. The Indian Army known as the Indian Peace Keeping Force (IPKF) was in north-eastern Sri Lanka in terms of the Indo-Lanka Agreement signed on 29 July 1987 Indian Prime Minister Rajiv Gandhi and Sri Lankan President Junius Richard Jayewardene. As a result the Indian Army was battling it out with the Tamil separatist Liberation Tigers of Tamil Eelam (LTTE) in the north and east. The Sri Lankan armed forces had to grapple with a violent campaign launched by the Janatha Vimukthi Peramuna (JVP). A new United National Party (UNP) Government under Ranasinghe Premadasa signed a truce with the LTTE and focused on suppressing the JVP insurgency. A brutal campaign of State terror was unleashed. Several State-backed para-military group engaged in violence. Human life was “short, nasty and brutish” in that dark year. Pushpakumara’s ‘Burning Birds’ relates the story of a family in Trincomalee that gets caught up in the cycle of violence during this time. The story is at three levels relating the decline in society at large, the diminution and downfall of the family in question and the decay and eventual destructive despair of the matriarchal chief breadwinner of the family. While this narrative of society, family and individual unfolds on screen, we are also able to witness the machismo, male-dominated society at its worst during times of conflict and the powerless helplessness of the women exploited most cruelly in such times. ‘Burning Birds’ is basically a story about a widow Kusum, her children and an unsympathetic mother-in-law. Kusum’s husband, a fishmonger, is killed by an armed vigilante group as a suspected subversive. She is left to fend for herself and her eight children. How she struggles to do so is the essence of the film’s story. Kusum is particularly keen that the eldest daughter Wasana continues with her studies. She struggles to earn money for the family. From working at a quarry and at an abattoir she eventually turns to prostitution. The sorrowful irony is that the same Kusum who rejects the advances of her employer and is abducted and gang raped, later turns to a brothel in order to cater to her family’s needs. Finally despair compels her to erupt in destructive violence. It is a powerful but tragically sad tale set against the bleak and (at times) desolate landscapes of Trincomalee. The strongest point of the film lies in its authenticity. To those who have knowledge and experience of the horrible happenings in a war torn society , the trauma and travails of Kusum and her family appear unmistakably true. To those familiar with the heavy toll that a war situation extracts on the weaker sections of society notably women and children, the terrible troubles undergone by the family are no exaggeration. You know such things have happened, are happening and are likely to happen again. This is where the director scores with striking impact. Some scenes are crudely brutal but help to provide the film a stamp of authenticity. The main reason for this to my mind is the personal background of Sanjeewa Pushpakumara. One is able to see some parallels and similarities between Pushpakumara’s life story and that of the family depicted on screen. Just as the film story is based in Trincomalee, Pushpakumara too was born in a remote village in Trincomalee District in 1977. In 1989 he lost his father. He was only 11 years old then and the eldest in a family of five boys and three girls. Sanjeewa’s mother was widowed at the age of 37. Pushpakumara also experienced the terror and trauma of violence from childhood while growing up in rural Trincomalee. When Sanjeewa was five years old, the LTTE killed several villagers including the school principal and his wife. He along with many others hid in the outlying jungles to save their lives. His schooling was interrupted. There were several such incidents in his life. Sanjeewa had suffered displacement too and has stayed at refugee camps for considerable periods of time. All these experiences – personal as well as that of his fellow villagers and the country at large – have motivated and inspired him into telling these tales realistically through film. The chief protagonist in ‘Burning Birds’ is the widow Kusum portrayed poignantly by Anoma Janadare. The character of Kusum ravaged by the vicious vicissitudes of life requires different shades and layers in its portrayal. Anoma Janadare plays it brilliantly bringing out the pain and agony while retaining indefatigable courage. We are seeing Anoma on screen after a long hiatus of about 15 years. We last saw her in Asoka Handagama’s ‘Thani Thatuwen Piyambanna’ (Flying with one Wing) in 2002. Incidentally Anoma won the Best Actress award at the Asian World Film Festival 2017 in Los Angeles for her role in ‘Devana Vihagun’. The other outstanding character is that of the eldest daughter Wasana played by Samanalee Fonseka. Samanalee who has made an impact through roles like Bunty in ‘Akasa Kusum’ and Taniya in ‘Motor Cycle’ does full justice to her role as Wasana in ‘Devena Vihagun’. There is an element of spontaneity in her acting and Samanalee to her credit seems to fit in naturally as Wasana. The director in a media interview stated that he had to take great care in directing both Anoma and Samanalee. Pushpakumara said that sometimes he took as many as 40 takes for just one shot. According to the director he took great pains to impress upon Anoma Janadare and Samanalee Fonseka to forget who they were in reality and simply transform themselves totally into the parts they played, namely, Kusum and Wasana. Apart from Anoma and Samanalee as Kusum and Wasana there are a number of other roles played by a variety of actors in the film. Some are rather tiny, amounting to cameo roles. Dialogue too is sparse and very often the characters speak very little. Against this backdrop some of the characters who do make an impression are Leonie Kotalawala, Mahendra Perera, Pubudu Chathuranga, Tissa Bandaranayake, Chandami Seneviratne, Shyam Fernando, Priyanka Samaraweera, Maheesha Nethara, Dasun Pathirana and Sanjeewa Dissanayake. Apart from the acting and actors, others worthy of mention are the director of photography Kalinga Deshapriya; editors Ajith Ramanayake and Katharine Wartena; art director/production designer Piyatissa Akurambada; makeup artiste Priyantha Dissanayake; costume designer Ajantha Alahakoon and the music directors R. Abaji and Philip David Sheppard. There is a hauntingly melodious lullaby type song falling within the traditional folk song genre. It is composed by Jithendra Vidyapathy and sung soulfully by Sriya Kariyawasam and Nipuni Saradha. Another remarkable feature of the film is its cinematography. 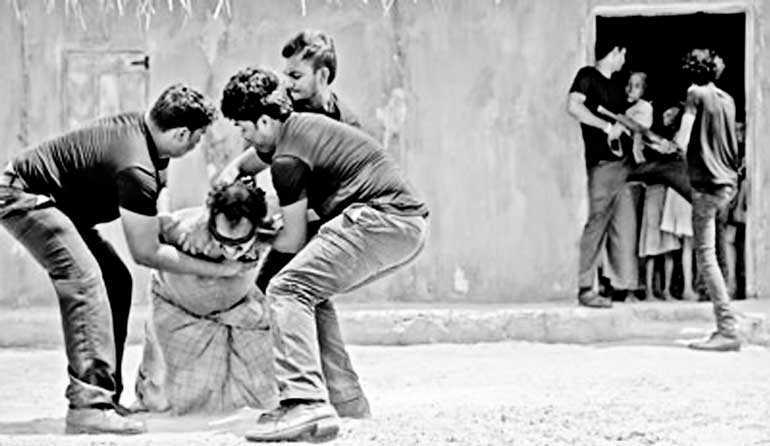 ‘Burning Birds’ has been entirely shot on location in various parts of Trincomalee. Kalinga Deshapriya Vithanage is the director of photography. He has been associated for long with renowned cinematographer Channa Deshapriya and could be regarded as a protégé of his namesake. In ‘Burning Birds’ the director Pushpakumara and cinematographer Deshapriya have resorted to the technique of shooting from a low angle. Filming from a lower angle provides a realistic aura like that of a documentary film. The use of low angle filming though seemingly excessive does enhance the sense of realism exuded by the movie. Another cinematic device used by the director-cinematographer duo is the usage of long or full shots. These wide angle shots usually take up the whole frame showing a person in full from head to foot and also the surroundings. This kind of filming achieves a clear physical representation of a character amidst the surroundings he or she is in. This wide visibility within the camera frame enables the audience to see a character or location from the director’s viewpoint. The wide angle shot also enables the director to show a wide range of activity with much detail to the audience simultaneously in one frame. In ‘Burning Birds’ the camera frequently moves at a leisurely pace panning the area. The director Pushpakumara when asked about his frequent usage of the long shot replied that he wanted to provide a meditative and realistic style to the film narrative. He said that he did not want quick camera movement. Elaborating further Pushpakumara stated that he wanted audiences to observe the human figures within a spatial relationship or characters in relation to their surroundings. ‘Burning Birds’ was written and directed by Sanjeewa Pushpakumara who also co-produced it along with Antonin Dedel. Sanjeewa began working on the script in October 2012. The principal shooting was over by mid-2015. Post-production was completed in March 2016. ‘Burning Birds’ premiered at the 21st Busan International Film Festival in South Korea in 2016 and was one of the films nominated for the best film category. Sanjeewa Pushpakumara’s maiden venture ‘Igillenna Maaluwo’ (Flying Fish) was banned in Sri Lanka by the Rajapaksa regime. It was not even allowed to be screened at a limited French film screening in Colombo. The times have now changed and Sanjeewa’s second feature film ‘Davena Vihagun’ (Burning Birds) has been cleared by the censors and is now running in Sri Lankan theatres. Furthermore it is being screened through the Ridma circuit run by the National Film Corporation. From ‘Flying Fish’ to ‘Burning Birds,’ Sanjeewa Pushpakumara has demonstrated that he is indeed one of the finest film makers in contemporary Sri Lanka.